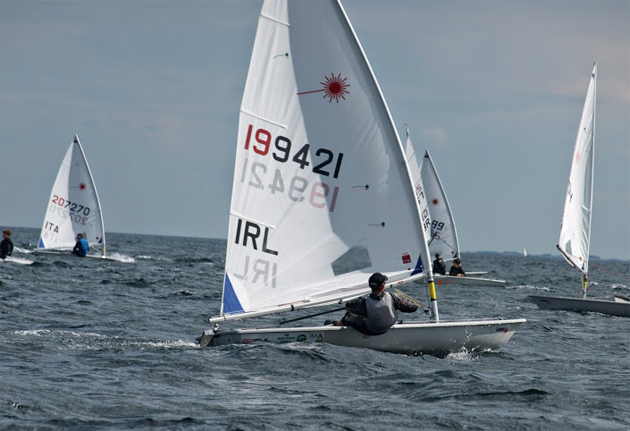 Séafra Guilfoyle in action at European Youth Laser Radial European Championships and Trophy, Denmark. The European Laser Radial Youth Championships and Trophy 2014 were hosted by EGO Sailing Club Denmark and finished today (July 3rd). A large contingent of Irish youth sailors both girls and boys sailed and achieved excellent results. A fleet of 155 boys competed before splitting the fleet into Gold and Silver. Twelve races were sailed with ten to count. Séafra finished sixth in the European Championship event followed by Cian Byrne 20th, Liam Glynn 27th and Conor O’Beirne 56th. In the Silver Fleet Dara O’Shea was 9th and Ross O’Sullivan 13th. In the girls fleet of 77, Irish placings were Erica Ruigrok 10th, Aisling Keller 14th, Sorcha Ní Shuilleabháin 23rd , Sorcha Donnelly 27th, Sarah Eames 29th and Laura Gilmore 40. Royal Cork’s Séafra Guilfoyle has now clocked up a splendid start to the season and must feel greatly encouraged as he prepares for the Worlds in Portugal.